Rumour Mill: Rangers eye English Premier League ace | Celtic to sell key man | Alex McLeish to recall duo? Rangers have been linked with a move for former Ibrox midfielder Steven Davis. The Northern Irish international is currently at Southampton but made over 200 appearances for the Gers between 2008 and 2012. Celtic could look to sell Belgian international defender Dedryck Boyata in the January transfer window, according to reports. The 27-year-old was linked with a Parkhead exit during the summer amid claims he was downing tools to avoid picking up an injury. Alex McLeish could look to bring back Steven Fletcher and James McArthur in a bid to get the right results against Albania and Israel in Scotland’s remaining UEFA Nations League games. Speaking after the 3-1 defeat to Portugal, McLeish said: “Steven Fletcher is back on the scene at Sheffield Wednesday and we’ll look at that with interest. Eros Grezda is hoping for a first start for Rangers this weekend after getting the green light from Steven Gerrard to play for his country. The Albanian winger played his first full 90 minutes in six months in the 2-0 Nations League loss to Israel on Sunday. Craig Gordon has questioned his role in Scotland manager Alex McLeish’s goalkeeper rotation policy after being picked for the friendlies against Belgium and Portugal, conceding seven in the process. Allan McGregor, who has retaken the No.1 spot from the Celtic ‘keeper, performed well against Albania and Israel. Gordon, first pick for the 2018 World Cup qualifiers, was asked if he thought it harsh that he had faced both elite teams. Celtic have rubbished claims that Daniel Arzani’s loan deal could be cut short by parent club Manchester City. 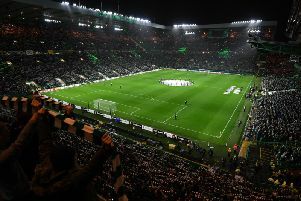 The Hoops have dismissed suggestions in Australia that the 19-year-old could be recalled before the end of the calendar year if he doesn’t make a first team appearance for the Scottish champions. Hibs defender Ryan Porteous admits Scott McKenna is the man to follow after watching his former Scotland Under-21 colleague make the step up to the senior squad. Porteous said: “I think Scott has shown he’s come from a couple of years ago struggling to get a game at Ayr to being one of the best centre-halves in the league and up there as one of the country’s best central defenders.